I love the new novel The Summer We Read Gatsby by Danielle Ganek. In one particular day-after-a-party scene, a girl named Pecksland makes a great lunch out of all the leftover food. 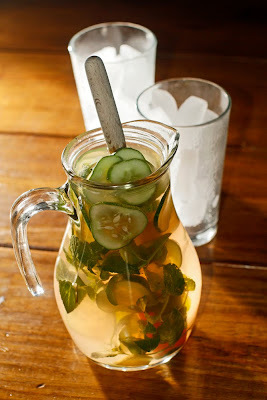 She also puts together pink lemonade (you can find another method here) with ginger, mint, and cucumber. I haven't stopped thinking about this lemonade because whenever I read a book or watch a movie and a character is cooking, I immediately want to make the exact same thing. 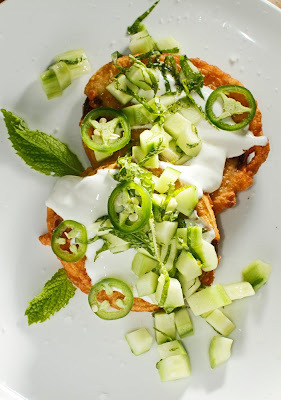 And I really get into stories with recipes like this one and this one. Oh, and this is amazing, too. Also this. I could read only this type of book and be perfectly content. If you have photos from the dinner you'd like to share, please send them to me, and I will post them. 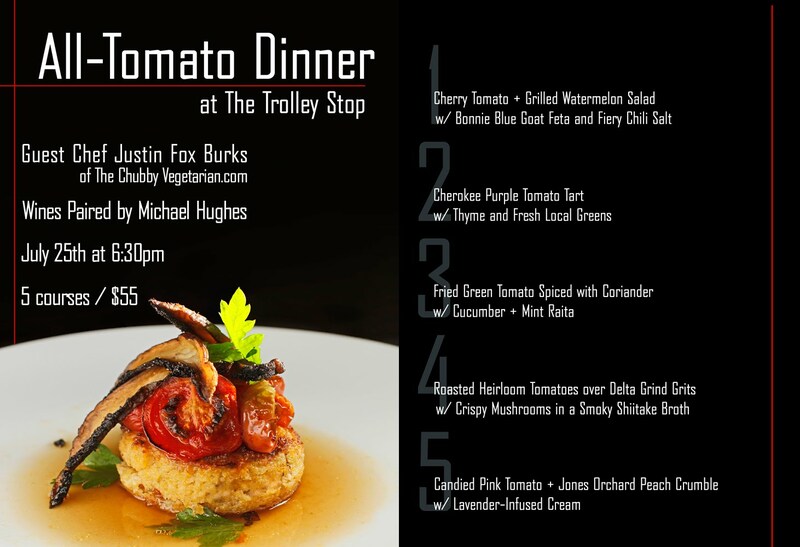 I just want to thank each and every one of you who came out to the All-Tomato Dinner at The Trolley Stop on Sunday. I truly believe that it was a success. I just don't think it could have been any better. 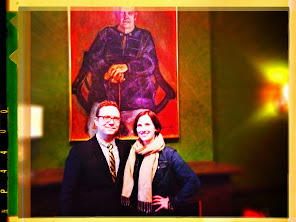 The atmosphere was light and fun, the food was wonderful, and the wine was perfect. All of this makes me think I may want to do something like this again sometime. Also a big thanks to Jill and Keith for hosting the party and proving the produce, Jeremy and Joel for helping out in the kitchen and in the front of the house, Michael for choosing and pouring some delicious wine, Bryan and John for providing the soundtrack, and my wife for making a wonderful dessert and also for putting up with me. Be forewarned: this is quite a strong sandwich. It almost made us cry! Well, okay, at least one of us teared up at the table; you can go ahead and guess who it was. BLTs are great and all, but there's that pesky bacon issue to deal with. Something big and savory needs to take its place, and here, there were 3 such ingredients vying for dominance: The sweet, salty crunch of Van Cheeseman's pickled onions, the peppery bite of arugula, the rich slices of Maytag blue cheese, and the sweet smokiness put forth by the tomatoes. It's almost too much to bear in the best way you can imagine, so you may want to take the dare and see if you can handle it. Slice summer tomatoes into pieces that are about 1/4-of-an-inch thick. Season each slice with salt, pepper, and a sprinkling of brown sugar. Using my grill top method, smoke tomatoes for about 3-4 minutes over a mixture of hickory and applewood chips. Now lay tomatoes in a single layer on a baking sheet and stick them in a 250 degree oven for about an hour or an hour and a half. (You want most of the liquid to evaporate and the top of the tomato to appear dry.) 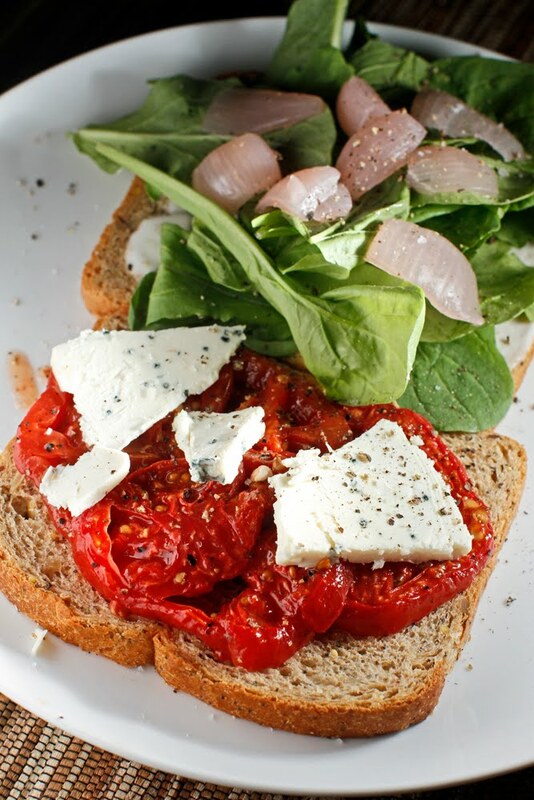 Allow tomato slices to cool completely before handling them or they will fall apart. Store in an airtight container for up to 10 days. The combination of smoke, pepper, and brown sugar makes these tomatoes irresistible. 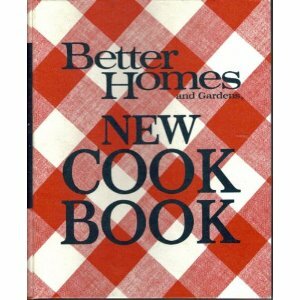 This 1968 cookbook is one of our favorites. I grew up using it and finally returned the borrowed-for-five-years family copy once I scored a brand new one at a recent estate sale. Everything in this cookbook just works out. So, on to these great drop biscuits, adapted from it. There is no need to roll these cathead-style biscuits out and cut them. In fact, being that meticulous ruins them! Just use an ice cream scoop with a heap of loosely packed dough and let them look messy; they taste better that way. Preheat oven to 450 degrees. Measure flour, baking powder, and salt into a bowl. Cut in the shortening with your hands until it's down to pea-size pieces. Make a well in the middle of the mix and add all the milk. (The secret is not to mix much at all -- use a rubber spatula to mix it very gently, almost as though you're just folding everything together.) Use that ice cream scoop to drop generous portions of biscuit dough into a Silpat-lined baking sheet; it should end up being 8 biscuits. Bake for 12-15 minutes. This main course recipe is one that is simple to make but looks elegant on the plate. It's good for dinner, but would also make a great brunch dish if it were served with some rosemary potatoes. I simply hollowed out one tomato per person by cutting the top off like you would a pumpkin and scooping the center out using a spoon. I lightly filled each tomato with a mixture of breadcrumbs, aged cheese, herbs, and eggs. The filling I used is very much akin to Lidia's Meatless Pecorino Meatballs. Set the tomatoes in a baking dish that just fits the number of tomatoes you are cooking so they don't roll around in the oven as they cook. Top each one with a spoonful of tomato sauce, drizzle them with olive oil, and put them into a 350 degree oven for about an hour. Top with a little more cheese and serve over wilted spinach with garlic and pine nuts. 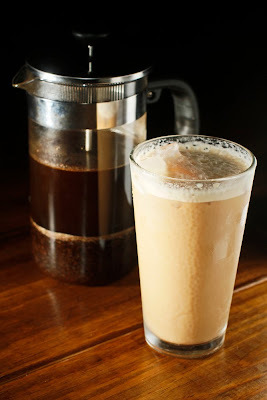 I've been meaning to use this method to make iced coffee this summer. Before you go to sleep, put 3/4 cup coarsely ground coffee in the French press, fill it with cold water, and let it sit overnight. In the morning, you just press it as usual, pour it over ice, mix in a little milk, and shake. This tastes much better than hot coffee over ice, which tends to be pretty bitter. We also did something similar with oatmeal. Put 1/2 cup quick oats and 1/2 cup steel-cut Irish oats in a container with 2 cups of cold water to soak overnight. 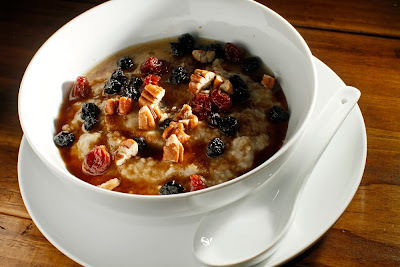 All you need to do in the a.m. is heat it up and top it with brown sugar, dried berries, maple syrup, pecans, butter, and salt. 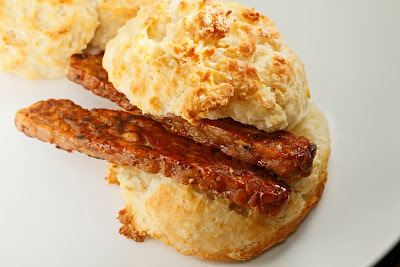 With a little planning, you can have a Saturday breakfast any day of the week. Go see Keith at the Whitton Farms booth at the Downtown Farmers Market this Saturday to purchase your tickets for my upcoming all-tomato, all-vegetarian, five-course dinner at The Trolley Stop, located at 704 Madison. This will happen next weekend on Sunday night, July 25th. There are a limited number of tickets, which will be first come, first served. 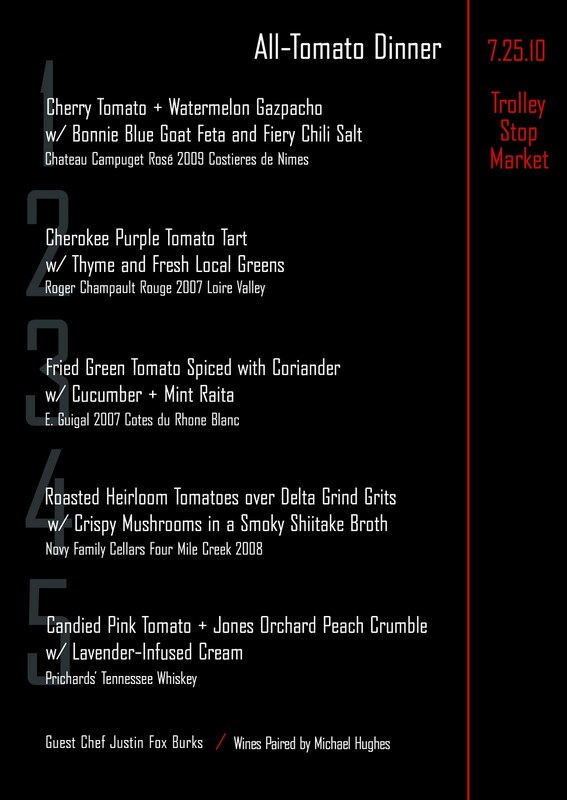 I can't wait to present my take on summer tomatoes at this event! Dried figs: I'm obsessed. The greenish kind on one of our fig trees are turning yellow and fat, but they are few and far between at this point. Dried figs, at least, are always plentiful. Recently, I was trying to think of a dessert to go with grilled pizza on the 4th, something a little Italian but not made with any heavy cream, which seems too cloying in the heat. I made half of these cookie-like, and the other half hard like traditional twice-baked biscottti for later with espresso. Preheat oven to 350 degrees. Next, finely chop the almonds and roughly chop the figs. Set both aside. Whisk the eggs and sugars together for 3-5 minutes until creamy. Add vanilla. Place dough on a floured surface, and with flour-dusted hands, shape it into a loaf about five inches wide and one inch tall. Bake for 15 minutes. Let it cool a bit and then use a knife coated in flour to cut the biscotti into slices about an inch wide. Place pieces back onto the cookie sheet. 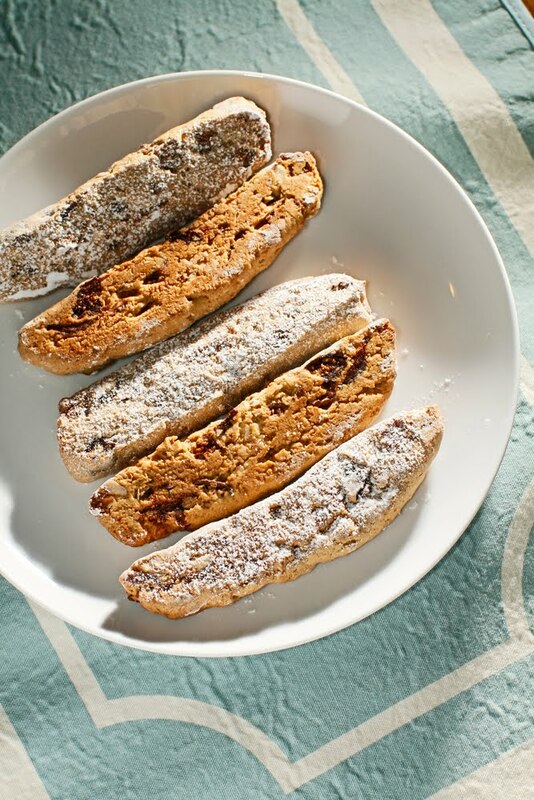 Cook for another 15 minutes until golden brown for a harder biscotti. When they cool, sprinkle them with powdered sugar on one side. 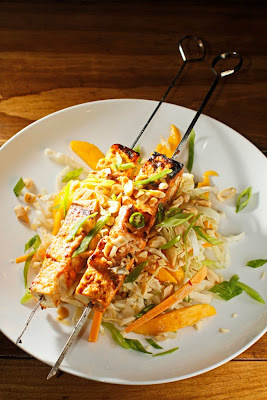 A dragon bowl (named for a dish we had at the High Noon Café in Jackson, MS) is basically beans, rice, greens, veggies, and a protein topped with spicy peanut sauce. This is the kind of dish you never make the same way twice because it's best to use what is fresh, in-season, or really, whatever you have in the fridge. The one constant is the peanut sauce, which is equal parts crunchy peanut butter, sriracha, rice vinegar, mirin, and soy sauce. It's vegan, it's inexpensive, and it's pretty delicious. Back in the day, we would almost always fix this (or spaghetti!) when we had people over to the apartment for dinner; it was easy to feed six famished people for less than 20 bucks. All of this came from the 4'x8' raised bed we built earlier this spring. The promise of really good tomatoes finally trumped front-yard aesthetics and concern about what the neighbors would think. (Backyard partial shade just wasn't going to cut it.) Now many of the neighbors actually want to pick everything for themselves, they tell us. They really seem not to be joking about this. 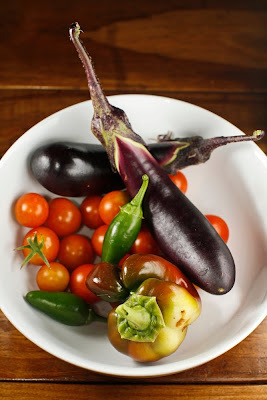 The idea of making caponata with all of this bounty clicked this week. 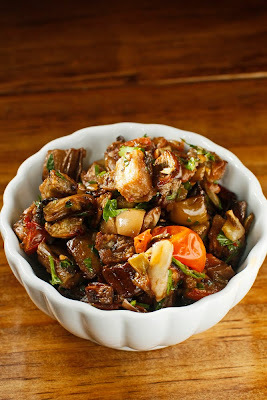 It's quick: dice any combination of Japanese eggplant, tomatoes, peppers, olives, mushrooms, and garlic. Chop some parsley, too. Add your sea salt, cracked pepper, crushed red pepper, and a good pour of olive oil. 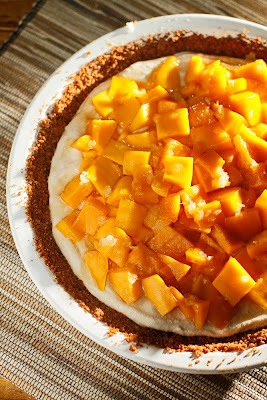 Toss it all together and bake the mixture in a rimmed pan for 20-30 minutes at 350 degrees. The meaty flavor and toothsome texture are a welcome addition to any Mediterranean-inspired meal. Caponata is good on French bread, with pasta, or on purple hull pea fritters. That is right! 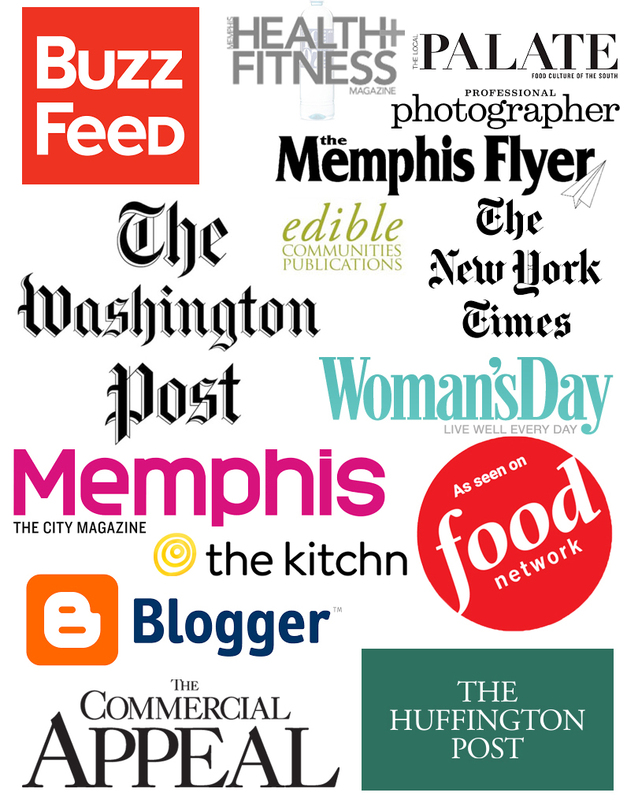 On Sunday, July 25th, I will be the guest chef at The Trolley Stop Market on Madison Ave. in Memphis, TN. What do I have in store for you? Tomatoes, tomatoes, and more tomatoes. I have put together a five-course, vegetarian menu that highlights my favorite summer fruit. 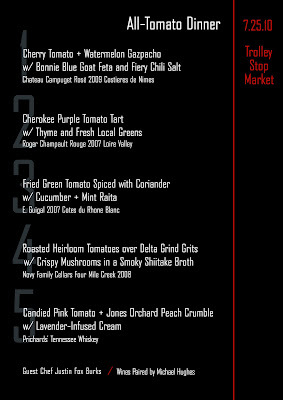 Each course will feature a different variety of tomato prepared in a unique way. For example, the third course (pictured here) will be coriander-spiced fried green tomatoes with a cucumber and mint raita. 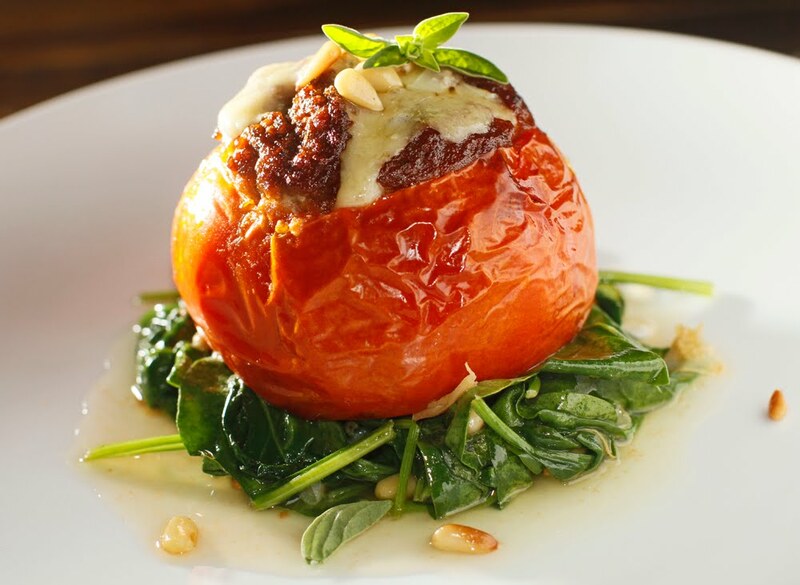 We even have a delicious, sweet tomato dessert in mind. As if that were not enough, my good friend and sommelier, Michael Hughes, will be pairing each course with a different wine. He has such a surprising take on wine paring that I can't wait to see what he comes up with for this dinner. It is sure to be smashing. 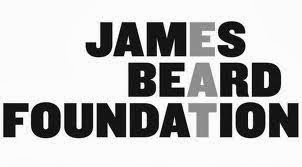 The cost will be between $50-$60 per person. We will seat 25 people, and I will give you the word on tickets as soon as Jill and I get all of the details hammered out. I'm so excited about this event. 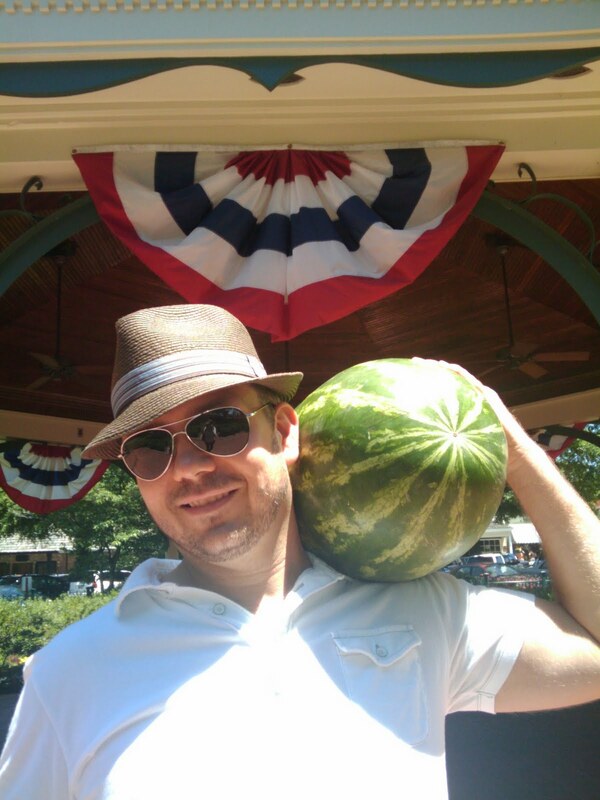 Coming up with ways to use this 35-pound watermelon from the fruit truck at the Collierville Town Square has been mighty entertaining the past few days. We're working on watermelon salad, pickled rind, popsicles, and the easiest of all, some agua fresca: scoop out some watermelon flesh, put it in the food processor, strain it to catch pulp and seeds, and garnish with lime and mint. Happy 4th of July! We finally staked the raised bed tomato plants today and had a few tiny green tomatoes fall off the vine of the prolific Sweet 100 and Jet Star vines. 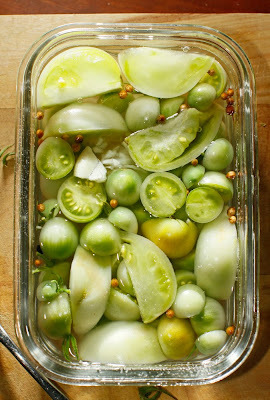 No problem; we pickled them just like this but minus the dill. After they sit in the fridge -- at least overnight but can keep up to two weeks -- we'll use them in a sandwich or a burger or as a nice addition to a cheese plate.